With insightful profiles for 23 of Angkor’s top temples and nearly 200 high-resolution images, this is the definitive guide to Angkor, Southeast Asia’s premier World Heritage destination. The ancient city’s temples inspire with their innovative architectural designs, world-class narrative reliefs and Hindu-Buddhist iconography. Still infused with their historical magic, they are yours to discover. This guide was an invaluable resource during our trip to Angkor. The floor plans, photos, and well-presented information make it interesting and easy to use. The guide also ranks the temples, which is very useful while planning visit if your time is limited. I highly recommend this guide. Angkor — the capital of the Khmer empire that thrived for 500 years from 802-1327 — is one of the most magnificent sites in southeast Asia. The ancient city’s temples inspire with their innovative architectural designs, world-class narrative reliefs and Hindu-Buddhist iconography. Still infused with their historical magic, they are yours to discover. Context. 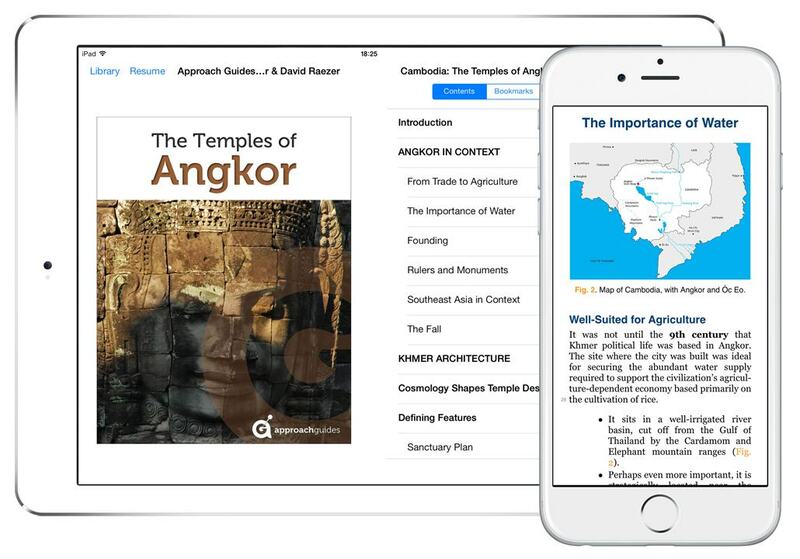 We begin by laying out basic features of the Khmer civilization that are particularly relevant for understanding Angkor: the global factors that took the Khmer empire from a fragmented, trade-based society to a centralized, agriculture-based powerhouse; its early cultural exchange with India; the rationale underlying the establishment of the capital in Angkor; and the nature of interactions with southeast Asian neighbors. Comprehensive look at Angkor’s art and architecture. We examine the distinctive Khmer style of art and architecture, isolating key features that you will see again and again on your temple visits; we tell you what makes them unique and what they symbolize. To make things come alive, we have packed our review with high-resolution images. Detailed temple profiles. 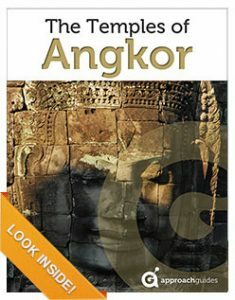 This guidebook provides detailed profiles for twenty-five of the premier religious monuments in Angkor. For each, we provide information on its history, a detailed plan that highlights its most important architectural and artistic features and a discussion that ties it all together. Advice for getting the best cultural experience. This guidebook supplies logistical advice, maps and links to online resources. Further, to help plan and prioritize your temple touring itinerary, we rank temples based on the quality of their art and architecture and offer brief summaries of each temple’s highlights, so you can focus in on what most interests you. Finally, we give our personal tips for getting the most from your experience while on location. Information the way you like it. 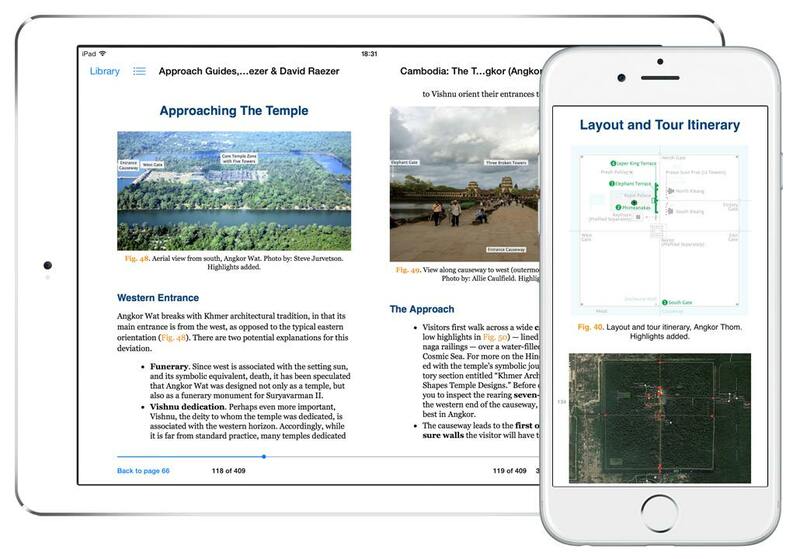 As with all of our guides, this book is optimized for intuitive, quick navigation; information is organized into bullet points to make absorption easy; and images are marked up with text that explains important features. Create your own itinerary with our map and ranking of Angkor’s temples.